Many people believe that an incredible app idea and the right functionality are enough, but in fact they’re just the beginning. What’s the next step, you ask? The launch? App development includes a number of stages, and everything should be thought through even at the earliest of them. To ensure your app idea is successful, you should come up with a pre-launch app marketing strategy. Let’s consider in more detail how you can market an app before it’s launched. There’s no silver bullet to resolve all app marketing issues, but consider these tactics that can help your app succeed. It’s difficult to survive with such an abundance of mobile applications in the app stores. Every successful project begins with a complete analysis of its target audience and the competition. This information is crucial when getting started. Knowing your market is everything. Exposure to what your target audience likes and needs and what challenges they face will give you a clearer picture of what they expect from you. To stand out, you also need to gather a lot of data-driven insights on your competitors’ apps. 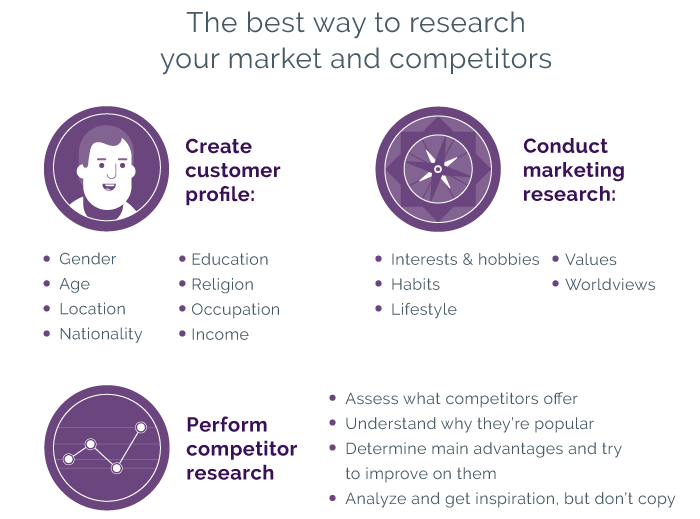 Collecting data on your competitors should become a regular habit. Keeping up on competitors is a great idea. If you don't know what the competition is up to, you can’t make sound decisions that will keep your existing users and bring in new ones. There are many ways to promote an app today: optimizing for app store algorithms, promoting your app on websites, and more. However, Google recently announced that people now most often find apps not on the App Store or Google Play Store but on search engines. We can expect this trend to continue. Even though 40 percent of people still find apps in an app store, you should think about the future and optimize your app so people can find it with search engines. According to Market Share Statistics, nearly 75 percent of users now start their searches for mobile apps on Google. 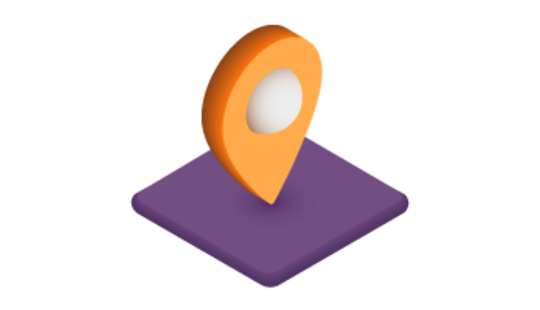 So make your app discoverable everywhere. Search ads are currently the most efficient way to market an app successfully and get people to download it. What’s the benefit of search ads? Search advertising not only boosts app awareness but also drives downloads because these ads are shown right when people are actively looking for mobile apps. Put another way, it’s now possible to find not only traditional web pages via organic search but also mobile app content. Don’t forget to optimize your mobile app for relevant search queries. Employ SEO tactics like selecting keywords in mobile app optimization process. To promote greater visibility and awareness of your mobile app, develop an SEO approach both for your website and for your mobile app. Content marketing is another way to advertise your app. Blog about the development process on your website, WordPress, Tumblr, or any other blogging platform. Blogging is a vital part of mobile app promotion. It builds interest around your product and provides better search visibility. Select target keywords, create quality content, and link to influencers to improve your blog’s search engine rankings. Create videos for YouTube. YouTube is a powerful tool to spread the word about your product. An effective way to market an app is to create a fun video like Uber did. Feel free to employ tactics such as connecting with trends, using famous heroes, and playing on sensational memes. Using video is a surefire way to increase engagement and downloads. And YouTube provides the largest audience. Create podcasts. Podcasts are audio or video content that is delivered right to a subscriber’s app. 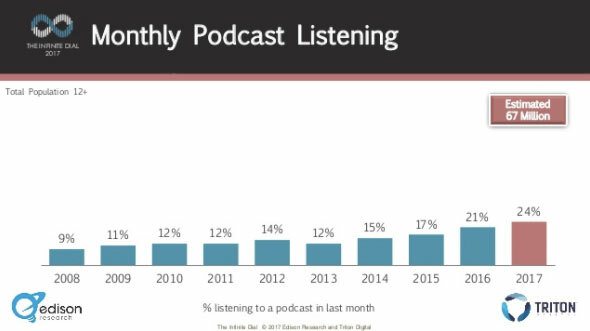 According to Edison Research, the total number of podcast listeners is approximately 112 million, and 67 million people listen to podcasts monthly. Why should you include podcasts in your marketing plan? Podcasts are rapidly growing in popularity and, what’s more, they’re simple to produce. And don’t forget that they reach people almost anywhere, bringing your message to a wide audience. Reach out to your target audience by finding them on websites, forums, blogs where you can market your mobile application. With the right approach and a bit of effort, you can boost your app to the top of the search results. A mobile app landing page plays an important role in app marketing strategies. A landing page is the best platform to create buzz around your mobile app. A landing page also motivates people to continue engaging with your product and ultimately to install your app. A landing page will help you show your app creatively, driving higher returns for your business. What separates them from others? If your landing page efficiently answers these four questions, then everything is in order. The app store is where people make the decision to become your users or not. If they aren’t impressed by your app store page, everything will be lost. Give careful consideration to your app store marketing strategy. Before you pick a name for your mobile app, make a careful study. Think of short phrases that customers are likely to type, list them, and select the most suitable. Your app’s name should be short, since titles longer than 25 symbols get cut off. Make it easy to spell but original, and express the essence of your app. An app’s name affects its ranking, so there’s one rule for all applications – an app’s main keyword should be in its name. But don’t use only keywords for a name. Try to find a middle ground between your unique branding and keywords. App optimization with keyword selection increases the number of app installs by 20 percent. In order to find the right keywords, brainstorm and use services like Google AdWords, App Annie, and Sensor Tower. Strive to maximize T and minimize Kol. 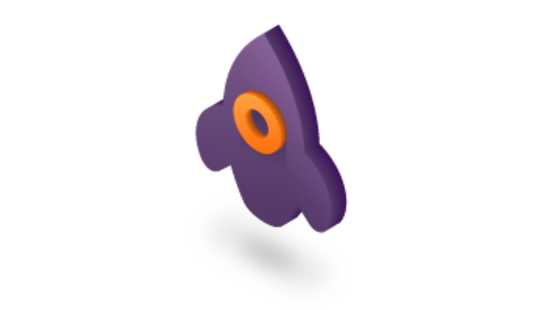 When searching for an app, users are drawn to its icon. Based on the icon, they decide whether to read the app description or look further. Your icon is the first opportunity to communicate with your audience. Having a vivid icon doesn’t mean you’ll get a huge number of downloads. But it guarantees that users will explore your app more, read its description or at least part of it, and look at some screenshots. After that, there’s a chance they’ll download it. Needless to say, having the perfect screenshots is also a must. Through screenshots, you can create a short story about your app (its core features and most important functions). Imagine you have approximately eight seconds to capture someone’s attention, so text alone won’t work. How should you respond? Show the main screen. The very first screenshot must demonstrate your app’s key features. The main screen shows users what the app is about and its core functionality. Write engaging captions for your screenshots. Different users may interpret screenshots differently. Write short captions that make clear what is happening on each screen. Remember that the idea is just to supplement screenshots, so keep captions short and clear. Show how to use your app. The best way to grab people’s attention is to strike their imagination. Show your audience what they can do with your app. You can use screenshots to create mini tutorials. Localization. Make sure your screenshots are in the right language for the region you’re targeting. Regular analysis of your mobile app KPIs will help you gain the best insights into your idea so you'll know how well your app’s doing. Let’s consider the most important KPIs to pay attention to when assessing your app’s success. Downloads indicates the number of times an app has been downloaded and is an early indication of how your app is doing. If your downloads aren’t going so well, you should reconsider your app marketing strategy; most likely that’s the problem. This metric shows how many people regularly use your app. The number of active users is a sign of how much interest there is in your app. 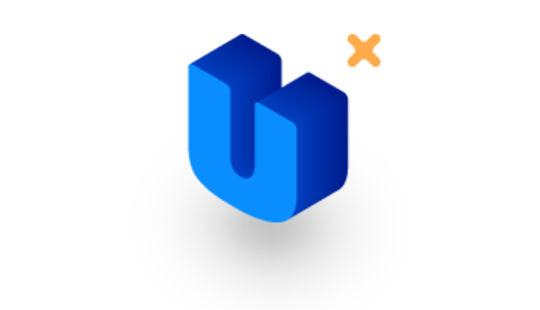 Active users can be categorized into daily active users (DAUs) ‒ users who open the app every day – and monthly active users (MAUs), who use the app at least once per month. 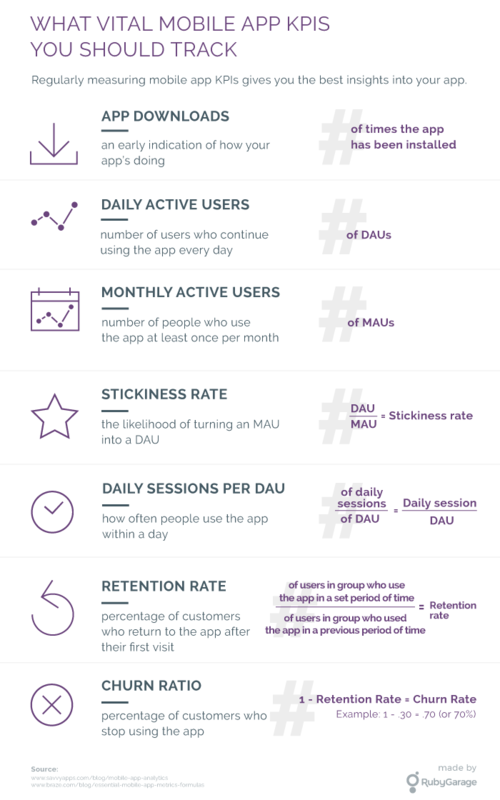 With these KPIs, you can measure your app’s stickiness. The stickiness rate measures the potential to turn an MAU into a DAU. This metric tells how often people make use of your app within a single day. Your DSL can tell you how often users are returning to your app. There are two reasons why your session length might be short. Let’s say that your app contains lots of quality content and features but your session length is not as long as you’d like. Why might that be? The reasons can vary from poor usability to poor quality of content. Maybe users just aren’t interested. If so, it’s time to rework your app. The retention rate demonstrates how many customers return to your app after their first visit. How can you measure retention rate? Compare a group of users over a recent period of time (this week) with users during an earlier period (say, last week). Using this metric, you can measure the percentage of customers who stop using your app. To solve the problem of a high churn ratio, examine more closely who is leaving your app. There are several reasons why users might never return. If they leave after installing your app, the problem may lie in an ineffective marketing strategy that attracts the wrong audience. Poor performance is another possibility. In that case, fix bugs, crashes, and other flaws. Don’t try to track too much data. 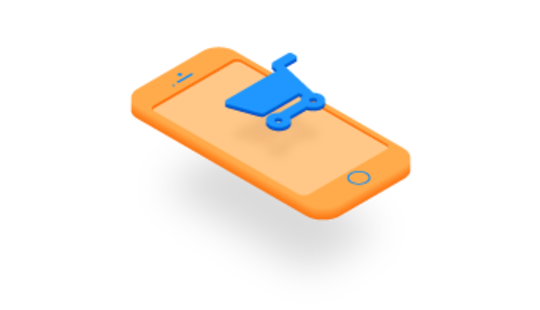 By knowing which mobile KPIs to measure and understanding how those KPIs relate to your mobile app’s success, you can effectively optimize your app and bring it to the top of its category. Building early buzz is important. Tell your audience your app’s story: what it is, the idea behind it, how it can help them, and so on. Telling your story in an engaging way can be a great way to get exposure. Teaser video. Humans are visual creatures, which is why videos are the most popular form of content today. What should you know about creating a promo video? If the first five seconds grabs the viewer’s attention, it’s a good sign. A video should focus only on your app’s the best features, not on all of them. Make sure you keep it short and to the point. Any good promo video has a strong call to action. As a final check, mute your video. If it still makes sense, it’s well done. Social media. 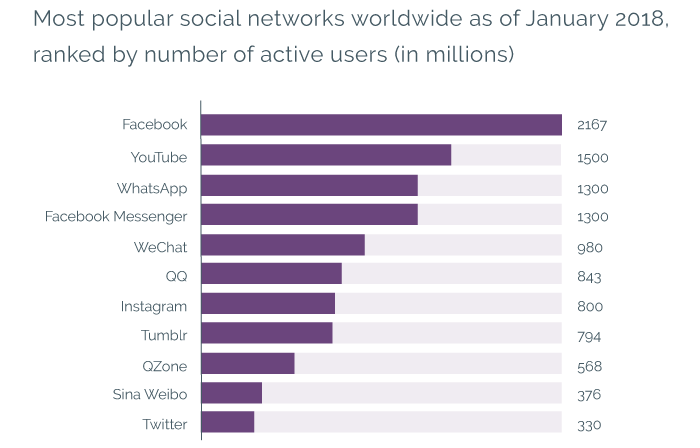 The popularity of social media has increased dramatically over the past few years (look at the statistics below). Social media has not only opened up communications internationally but has also helped businesses reach their potential customers more easily. Social networks have access to important data about users’ interests, hobbies, and so on. This information can help businesses to target their advertisements. Social media channels have developed targeted ad solutions that you can use to reach your audience based on profiles. The same cannot be said for search engines. Content. Prepare content and publish regularly. Be creative and innovative with the types of content you use. Encourage online communities to download your app when it’s ready by creating posts that get people involved and by generating viral content. Community. Promoting mobile applications in specific communities is a good way. The key is to choose the right communities in which to advertise. Find like-minded people who share your interests. Opinion leaders. These are people or organizations that have such a strong social status that their recommendations and opinions are listened to when making important decisions. Finding and enlisting opinion leaders to help promote your app can be critical to reaching your target audience. With the right blogger communicating with your target audience,your chances are good. Opinion leaders have already established their authority and can use it to persuade their followers (your potential customers). Targeted advertising. Facebook Ads is one of the prominent platforms. Targeted advertising allows you to customize advertising as accurately as possible since ads are targeted solely at your potential users. Reviews. Reviews allow users to understand whether they want an app. It’s important to clearly understand which reviews can lead more users to download your app. Text reviews should be accompanied by colorful screenshots and images. Provide core information about your product: What does the app do? What are its main features? What is its value proposition? Compare your mobile app to similar apps and provide readers with proof that your app is better. The mobile app industry is constantly evolving and entrepreneurs have to stay vigilant if they want to be on top of app stores. Today, marketers have access to more data than ever, but data doesn’t necessarily mean answers. At first glance, the tactics you’ve put into practice may appear to be working. But at the end of the day, your marketing strategies may not go so well. There’s no secret tool or perfect KPI to guarantee your app’s success, but you should be able to discover new opportunities and challenges and have the flexibility to review marketing measurements for growth. Always keep in mind your users and their feelings about your app. When dealing with mobile application marketing, every detail is essential. Also, bear in mind that each method for app promotion must be mixed with others. For example, you can combine ASO optimization with Facebook ads. None of these marketing strategies for apps will give satisfactory results on its own. No matter which method you choose, it’s important to understand what it can give you in return, what you’ll lose, and what you’ll gain. Now you know the best ways to market an app before launch and you can confidently take action to promote your mobile app. And if you’re trying to figure out how to make money from your mobile app after it’s launched, check our article “How do free mobile apps make money”.